Lost Legacy is the story of hidden family secrets. Since everyone has a family of some sort, I think most people will find that intriguing. Zoe Chambers, EMT in Monongahela County PA, didn’t realize there were any family secrets in her family until a farmer turns up dead in a barn that her uncles use to own. When the investigation into the death begins, it gets very personal for Zoe very quickly. Her mom and stepdad coming to visit from Florida don’t help the situation. This is the second mystery in the Zoe Chambers series and I am really enjoying them. In the first one, Circle of Influence, we met our characters, Zoe, Pete, Sylvia, the Krolls, and they became people we could relate to instantly. There wasn’t any of that first-book-in-a-series awkwardness. Now we meet Zoe’s mom and Pete’s dad. The characters become even more 3-dimensional. 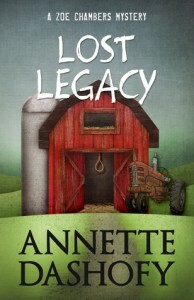 Annette Dashofy knows how to write realistic characters. This is what I classify as a Contemporary Traditional Mystery. It’s not a cozy but it’s not gritty. The mystery is the focus and it’s well done. There are believable red herring and the answer makes sense with what we’ve read. I’m definitely ready to move on to the next one! Book provided by Netgalley but my reviews are always honest and written for other readers like me.